And the noodles and the marrow bone. 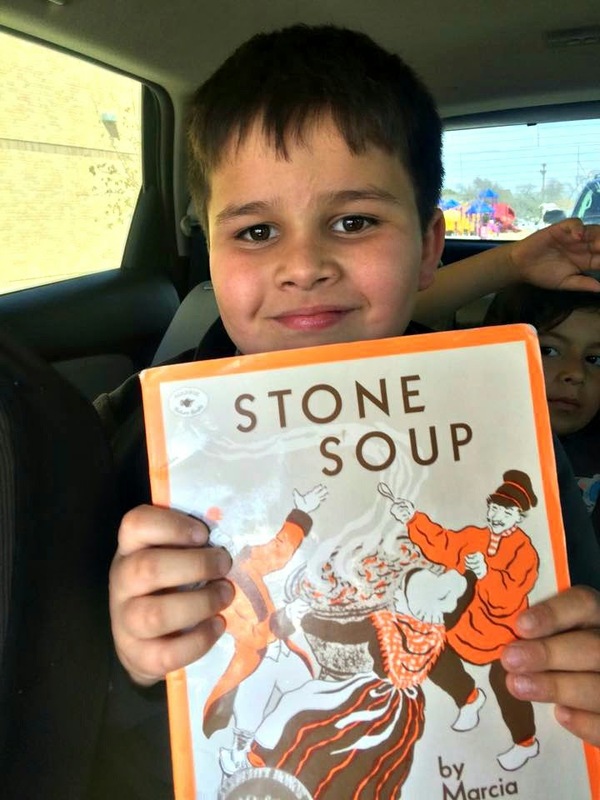 Have you ever had stone soup? If you haven't, well, you're missing out! The recipe is quite simple! A while back I was lucky enough to have some of the Littles over for the week. They hiked around the mountain, examined all the new trees, played at the ranch and just had fun. 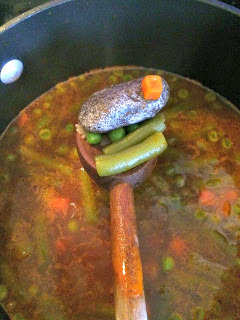 One day I asked them if they wanted to make Stone Soup. I got a look that said, “Mamye has really lost her mind. Doesn’t she know a stone is a rock? 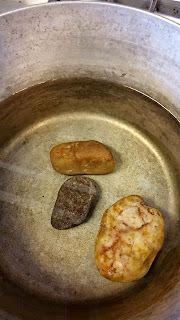 You can’t make soup out of rocks!” I sent them outside to each find a good ‘stone’. “Stone Soup” is an old folk tale. I remember hearing it in second grade. Throughout the years there have been many variations. Basically, it goes like this. A traveler was making his way through a village one day. He was tired and hungry. He started a fire and got ready to set up camp for the night. He pulled out a pot that he filled with water. Then, he added a clean stone that he’d taken from his pocket to the pot. . Finally one of the villagers came over to see what he was doing. He told the villager he was making stone soup. The curious villager questioned him and he said it would taste better if there was a little cabbage to add. So the villager found some cabbage to add. This continued with the curious villagers asking about the soup and the clever traveler suggesting ingredients to add that would make the soup better. Soon he had an aromatic, tasty soup that he shared with the villagers. When everyone had their fill he gifted the stone to the villagers so that they could make stone soup long after he was gone. The kids came in, each with a ‘stone’ in hand. I washed and scrubbed them until I was sure there wasn’t anything foreign and filled a pot with water. I put all of them in the pot and turned on the burner. Clean stones to start the soup! They went off, doing what they do, and I snuck some beef bouillon into the pot so there would be some flavor when they sampled their concoction. After a bit of hesitation, making sure they weren’t eating dirt, they each tasted the broth. Because of the bullion, it had a nice taste. They approved. Next we proceeded to see what would make it better. We loaded the pot with extra vegetables, some pasta, some tomato juice and even some meat that was leftover from another meal. The fun thing was I let them pick what to add. The kids loved it! We all had a lot of fun. And they got to take their ‘stones’ home so they could do it again! 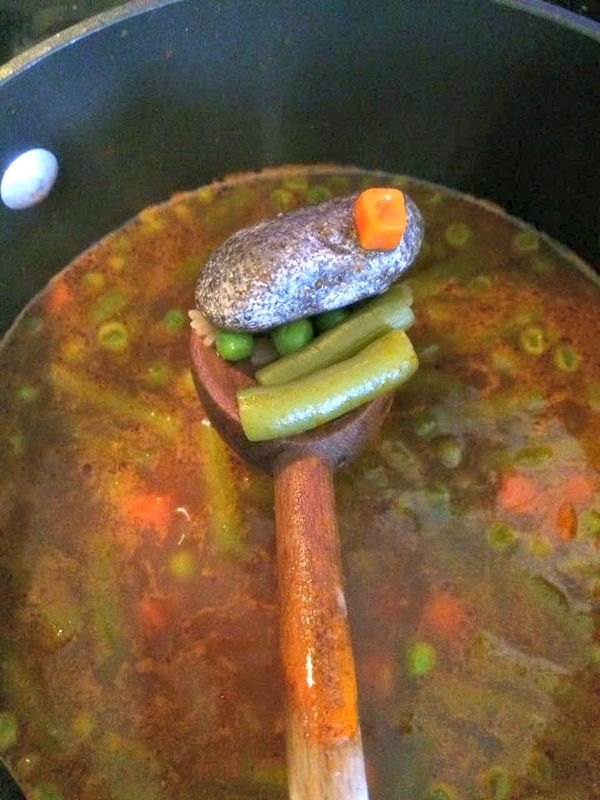 And the wonderful wonderful soup stone. 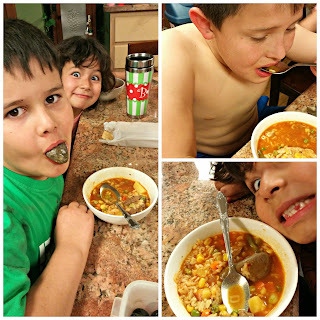 The kids were impressed with the Stone Soup we made. As soon as possible, Caleb went to the school library and checked out the book! Is he checking to see if I told the story correctly? Not to be outdone, Belle checked out a copy the next day! Whatever it takes to make them read! Little did their mom know that she would soon get to join in the fun! Guess what they wanted for supper? Right. They made Stone Soup! 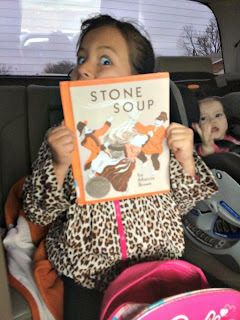 It’s good to know they will remember the time we all made Stone Soup with Mamye and Pap. It’s great to know that together we made a memory.